Like Austen's PRIDE AND PREJUDICE, Charlotte Bronte's classic, JANE EYRE, seems to be remade every few years whether it be in a TV miniseries, movie, or play. This version, from director Cary Fukunaga, plays up the more Gothic elements of the classic story. Even though the story is over 150 years old, the rich characters, sweeping scenery, and epic romance still hold up today. We follow our heroine, Jane (played by Mia Wasikowska), through a troubled childhood where she is sent away to school by her aunt, and because of her unaltered and tenacious spirit, is constantly punished and scorned by her teachers. Eventually, she becomes the governess of the manor, Thornfield, to care for Adele, the ward of the elusive Mr. Rochester (Michael Fassbender). When she finally sits down to talk with Rochester, he abrasive manner doesn't faze Jane. She sees right through his demeanor and verbally keeps up with his snippy remarks. This fascinates Rochester. He becomes infatuated with her and believes she's the one that can shine light into his dark world. Wasikowska and Fassbender are fabulous portraying these iconic characters. Wasikowska's Jane is subtle yet strong. She reminded me of a somewhat quieter Elizabeth Bennet from PRIDE AND PREJUDICE; same amount of wit and charm but on a lower key. 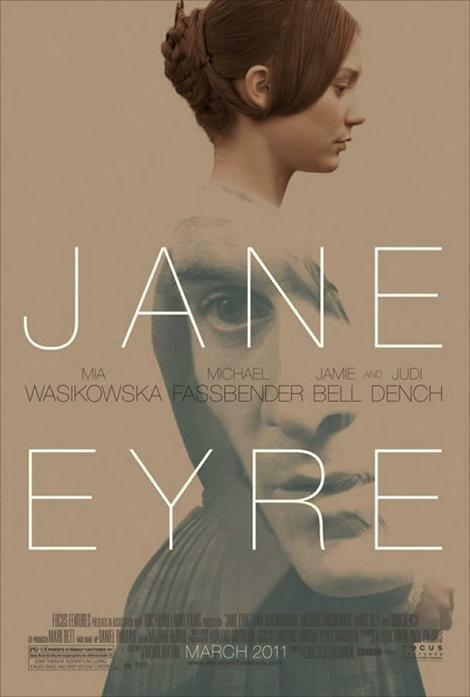 She makes Jane Eyre a complicated, dynamic figure where we see her history and how it's shaped her internally. Fassbender takes an interesting approach to Rochester. In the book, Rochester can come across as extremely arrogant, which he is, but never really likable. Fassbender shows his arrogance coupled with a flirty nature almost similar to "the guy" in high school that all the ladies longed for. He humored them, but he was never interested because he was looking for someone deeper and more intellectual. Then all it takes is one girl to match his wit and snarkiness, and he's infatuated and in love. This Rochester was enjoyable and fit into the dashing, dominant, yet has-a-weak-spot-for-the-one-he-loves, Victorian gentleman perfectly. While they individually embodied their characters, I never fully believed their chemistry. This is to no fault of the actors. When an epic novel rich in detail is adapted into a movie, it's very difficult to not only establish the relationship but wholeheartedly convince us of their love. Even though the movie runs at a healthy two hours, I wanted Eyre and Rochester's relationship a little more developed, so that we feel the weight and tragedy when the "secret" is finally revealed. Fukunaga makes use of the breathtaking manor and picturesque scenery of England. The visuals alone are worth the price of admission. Thorfield, the Rochester manor, becomes it's own character as it's so mammoth and ancient we almost hear every creak and movement throughout. Fukunaga plays up the Gothic aspect and makes use of our imaginations when Jane explores the house at night with only a candle for light. There is no extra light provided, so we're just waiting for a ghost or someone to pop out around any corner. All in all, this adaptation will bode well in the Jane Eyre catalogue. Will it be everyone's favorite? Probably not. However, when taking such a classic novel and really taking to it with a fresh perspective, it makes the movie memorable.